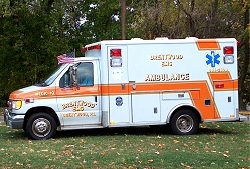 For over 35 years, Brentwood Emergency Medical Services has proudly served community members in times of crisis. Founded in 1977 as a volunteer group using a converted Fire Department vehicle, the organization has grown to contain a full time staff of courteous employees who are equipped with the latest in paramedic training. The organization also features modern vehicles and advanced lifesaving devices. Brentwood EMS responds to medical emergencies, assists police and fire crews at accident and crime scenes, and transports patients safely and quickly for non-emergency treatment. For more information, or if you are interested in becoming a volunteer contributor, please visit the organization website. Monthly EMS service reports to Council can be accessed here.